If you are bitten by a dog and feel pain, seek medical attention immediately! There is the possibility of infection, including rabies and other diseases, and you should be seen by a doctor as soon as possible. the injured person was not trespassing, committing another tort, or provoking the dog. Massachusetts’s law applies not only to dog bites, but to any injury a dog causes to another person. For instance, suppose you are standing on the sidewalk when a neighbor’s dog runs up and jumps on you, knocking you down and causing injury. The Massachusetts dog bite statute would apply in that instance too. Massachusetts is also known as a “strict liability” state. Dog owners are still liable for injuries their dogs cause even if the owner had no prior knowledge that the dog would bite or cause injury. In other words, someone who has been injured by a dog does not need to show fault on the part of the owner. And remember, Massachusetts’s strict liability rule applies to both dog bites and other injuries caused by dogs. So if a dog knocks a person down or causes injury in other ways, but doesn’t bite, the rule still applies. 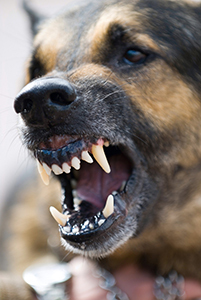 If you were injured as the result of a dog bite, I suggest you speak with an attorney who is familiar in handling “dog bite” cases. There may be issues regarding insurance, ownership of the dog, and even defenses against the claim. The initial consultation is free and, even if you choose not to make a claim or an attorney believes the costs of pursuing a claim may exceed the amount that would ultimately be paid to you, you will be receiving valuable advice at absolutely no obligation. If you were a victim of a dog bite and would like more information, please call me at (617) 564-3299 or contact me online.